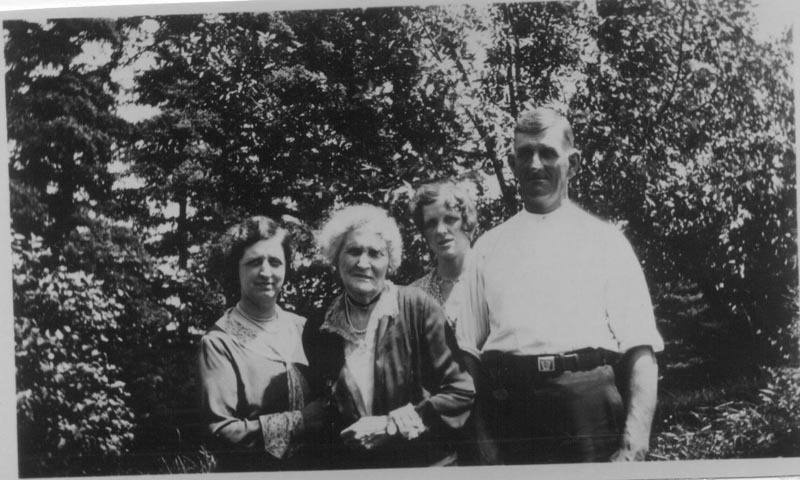 This picture shows the family of Alexander Duggan and family, L-R: Agnes (b. 9 October 1890), Earl (b. 13 February 1896), Charles (b. 10 April 1898), Arnold (b. 23 January 1894), Alexander (b. 14 August 1859), Beatrice (b. 15 January 1889). Alexander and most of his children were born at East Dover, N.S. but the family relocated to Halifax in the mid 1890s. 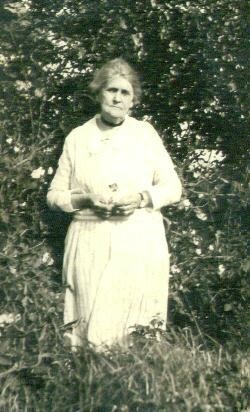 This picture shows a young Mabel Duggan, daughter of Owen Duggan. 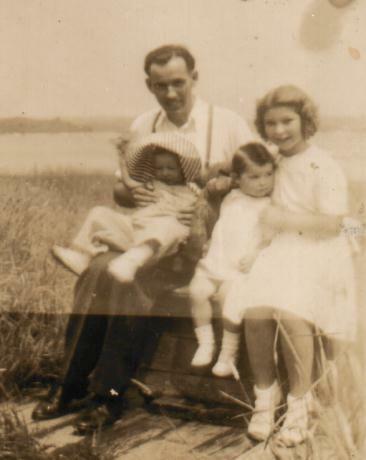 This picture shows Hilda Duggan, d/o Nathan and Margaret Minette (Mason) Duggan and wife of Michael Duggan, s/o Michael and Mary (Merlin) Duggan and her son St. Claire Duggan. 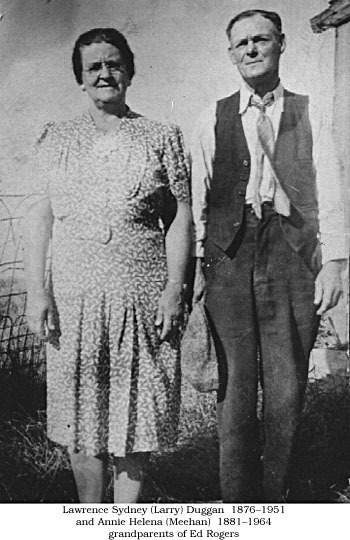 Lawrence Sydney Duggan (1876-1951) and his wife Annie Helena Meehan, d/o Samuel and Emma (Doherty) Meehan. Contributed by Ed Rogers, grandson. This picture shows Annie (Meehan) Duggan wife of Lawrence Sydney Duggan and her daughter Ada Duggan. The woman on the right hand side of the image was likely Annie's sister Hilda Meehan. This photo was taken on 15 July 1929. This picture shows St. Claire Duggan with Joan Duggan, d/o Earl Duggan. The two are holding St. Claire's daughter Marguerite and Joan's sister Shirley. This picture shows Earl Duggan, s/o Nathan and Margaret Minnette (Mason) Duggan, b. 27 November 1902. This picture was taken at White's Lake in about 1952 on the stoop of the Duggan cottage. Front row L-R: Margaret Catherine (Meehan) Duggan, her husband Daniel McGuire Duggan and on the back row Nora Rebecca (Walsh) Redmond and her husband William Arthur Redmond. This is a picture of Johanna (White) Duggan the wife of John Duggan. This picture was taken at White's Lake ca. 1942. Kitty, Daniel, Joanna and Evangeline Duggan. This picture shows L-R: Kitty Duggan, Joanna (White) Duggan, Evangeline Mary Duggan and her father Daniel McGuire Duggan. Kitty Duggan was the daughter of Joanna (White) Duggan and at the time of this photo in 1939 she was working as a nurse in New York. Evangeline was also a nurse and also worked in New York.